It’s that wonderful time of the year when Nordstrom puts a good portion of its fall-winter offerings on sale for the upcoming season! 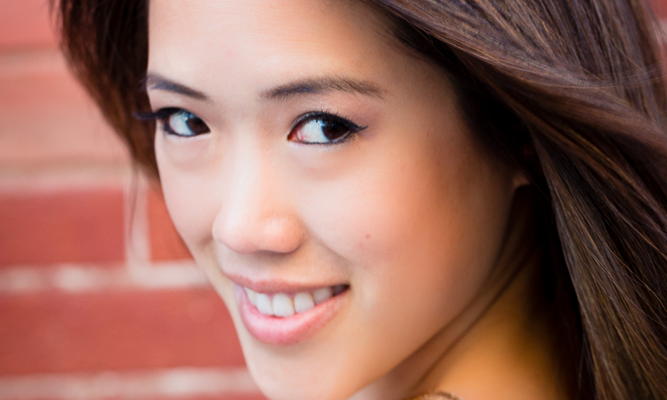 It may feel a bit odd to be checking out sweaters, boots, and thick layers when it’s floaty-dress weather out, but it’s great to get a jump start on preparation for the months ahead. Here are my top loves and recommendations of this year’s sale, based on my own recent flurry of purchases (delivery man, thank you for lugging so many big boxes to our front door!) and brand knowledge. These suggestions do not cover the full range of fall seasonal staples (e.g. the ‘must-have jacket’, the ‘essential leather piece’, etc. ), but they are all rock-solid additions to your existing wardrobe, that I can guarantee will be often-used and much-loved for seasons to come. The styles selected fall generally along casual-sophisticated, comfortable, and classic lines. 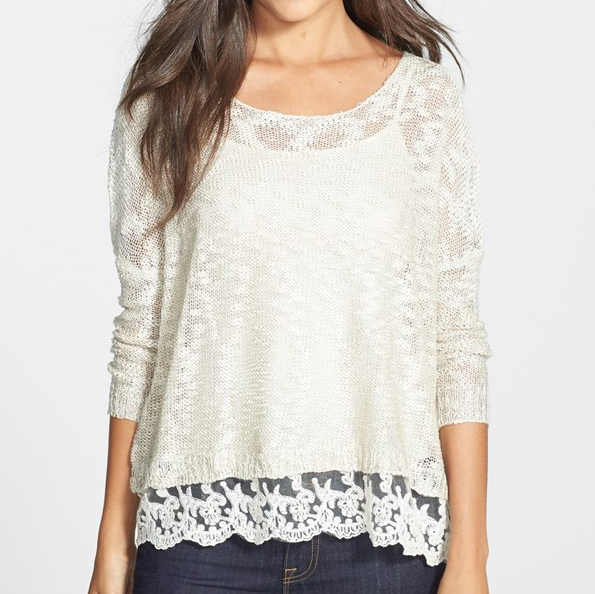 Love By Design crochet hem sweater ($28.90): This light-weight, slouchy, over-sized sweater is surprisingly and delightfully soft and cuddly. I usually wear a size 2, and ordered this in a Junior’s size small. It fits my arms perfectly, and drapes a good 5″ away from my body; this is not a fitted-shape sweater. It’s an easy, comfortable style dressed up with a wide crochet-lace hem, and comes in three colors: blush, oatmeal, and sage. 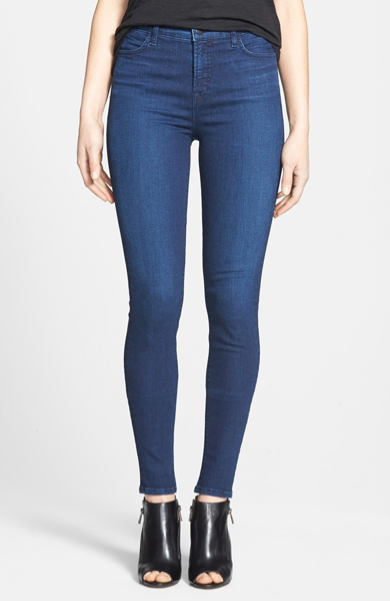 J Brand ‘Maria’ high-rise skinny jeans ($118.90) or Paige denim ‘Skyline’ ankle peg skinny jeans ($119.90): Both of these jeans are worthy closet-staples. I bought the older version of the J Brand jeans two years ago and wore them so much, the material wore away in several areas(!) I immediately got these stretchy skinnies as replacement. If you’re afraid of skinnies going out of style (wider legs are finally coming back), the Paige jeans are a good option, with their flattering slim silhouette, but wider opening that looks great when cuffed. 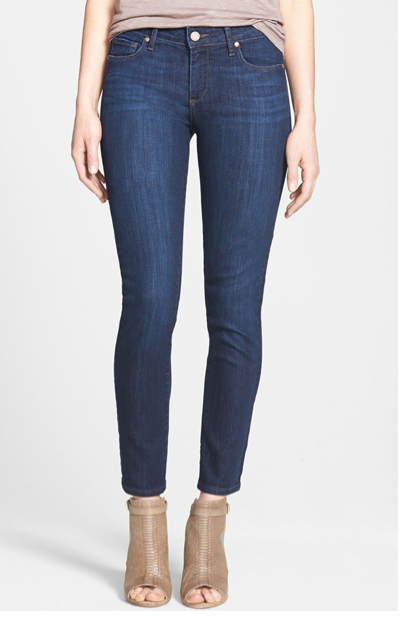 The J Brand jeans have more of a jean-legging feel, and the Paige jeans have a slightly heavier, traditional denim feel. I love them both! Chelsea28 cabled crop sweater ($58.90) layered with Equipment ‘Margaux’ pinstripe cotton shirt ($124.90): Okay, these are two things, but I’m counting them as one great combination. Winter layers are too often dark, so I enjoy finding layers that are on the light and bright side. 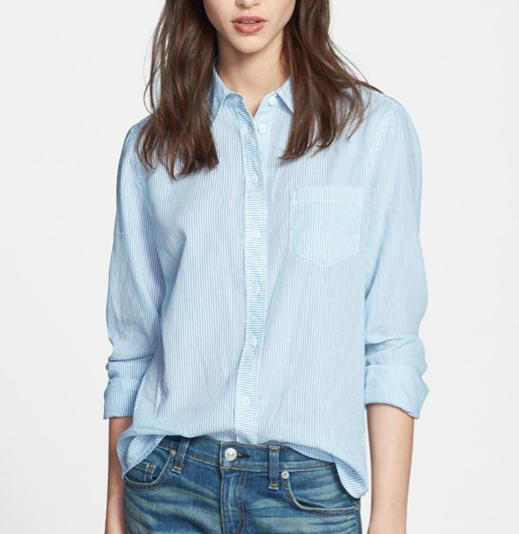 Equipment makes awesome shirts, and this thin pinstripe version is an absolute classic. 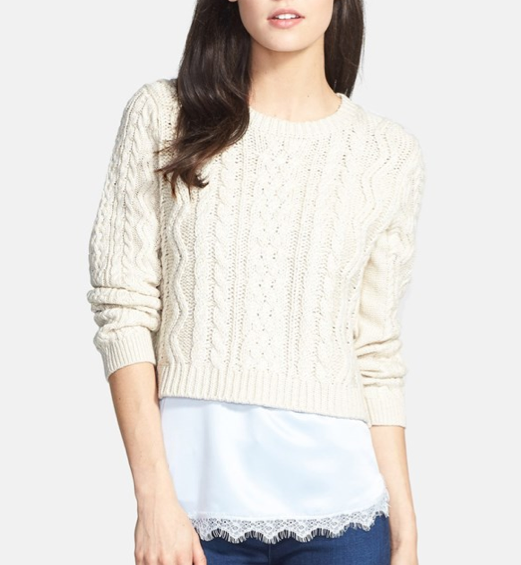 Pair it with the on-trend Chelsea28 cropped sweater for a cute and slightly-preppy look with lovely textural contrast. Stuart Weitzman “Highway” over-the-knee boots ($439.90): I’m a devoted fan of the flat version of Stuart Weitzman 50/50 leather boots, named for their dual leg paneling of leather and elasticized micro stretch fabric. The snug flexibility of the fabric backing allows the boot to conform sexily to a range of leg widths. I have pretty defined, athletic (translation: wide – almost 15″ at the thickest point) calves, and the M sizing works great. It may feel particularly snug upon initial wears (and taking it off may be a small work-out), but it ensures a close fit that won’t sag over time. 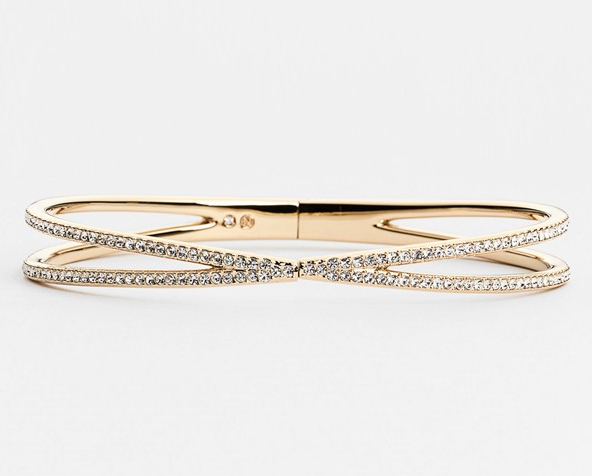 Nadri pave hinged open bracelet ($59.90): Nadri is similar to Tai, and is what I consider to be a luxury costume jewelry line. They’re very reasonable in price, but look as amazing as their fine jewelry counterparts. 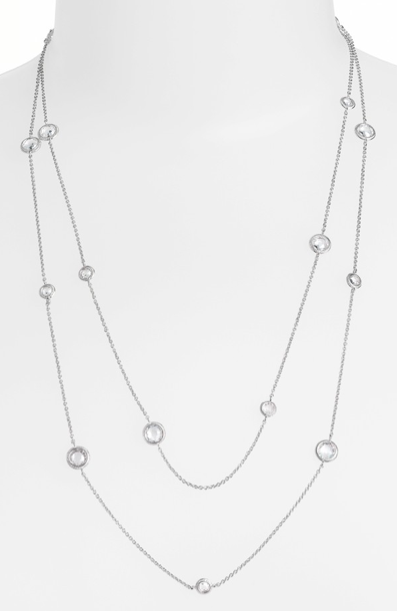 Nadri’s cubic zirconium treatment and designs are simply stunning. I particularly love the criss-cross design of this bracelet which is both delicate in width, but more substantial with the illusion of two bracelets. 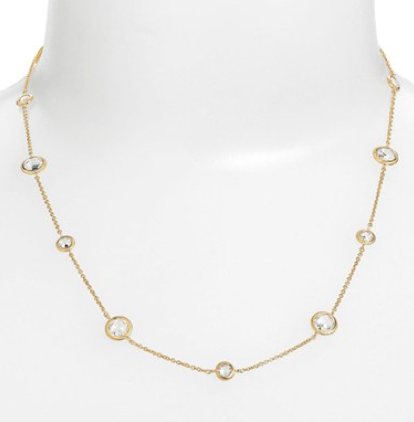 Nadri Station necklace ($44.90) and Nadri long bezel Station necklace ($99.90): Another classic style by the same brand; I just couldn’t resist. These two necklaces are lovely either layered or on their own, and can be worn as a necklace or wrapped-bracelet. Enjoy wearing these to add sparkle to your everyday life. 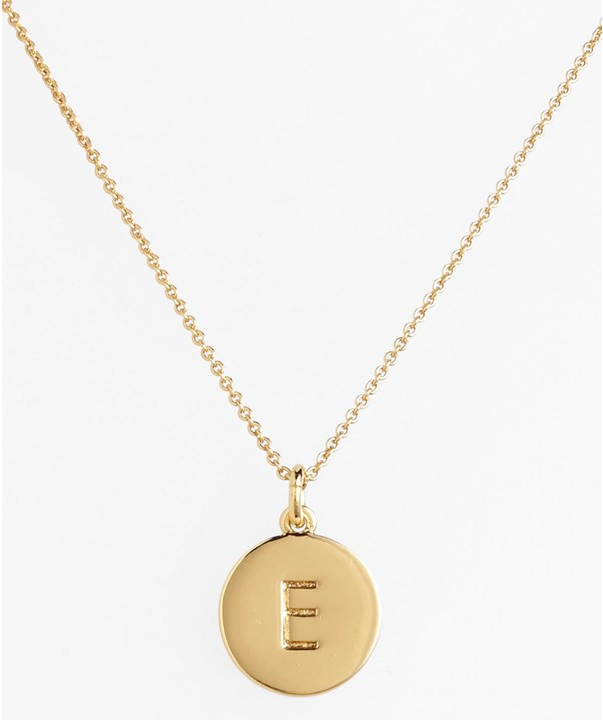 Kate Spade ‘one-in-a-million’ initial pendant necklace ($37.90): Simple, understated, and elegant define this necklace perfectly. Available in all 26 letters, it is a clean but personal design with subtle, personal meaning. Name necklaces are also popular, but for those who prefer to keep a bit more private, this is a great alternative. 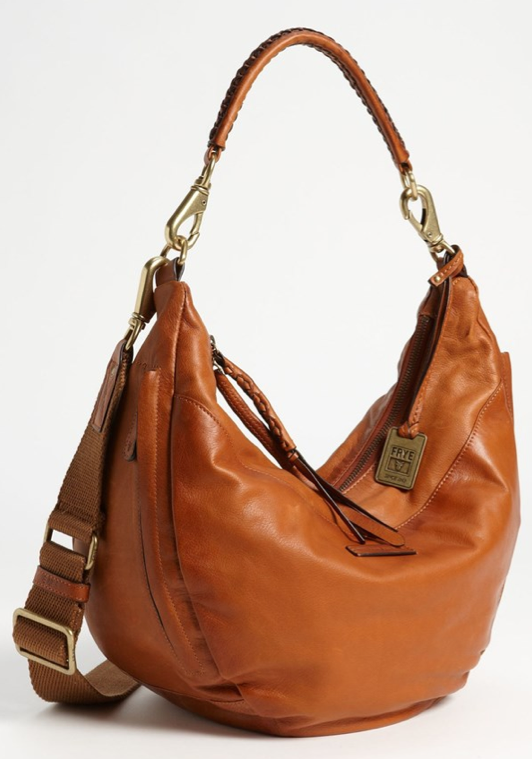 Frye ‘Jenny’ leather hobo bag ($285.90): If you’re familiar with Frye leather shoes, you know that they’re robust, high-quality designs that age gracefully. I expect the same of this bag, and believe that it will look great a few years down the road, as it gains character and maintains the warmth of the new version. 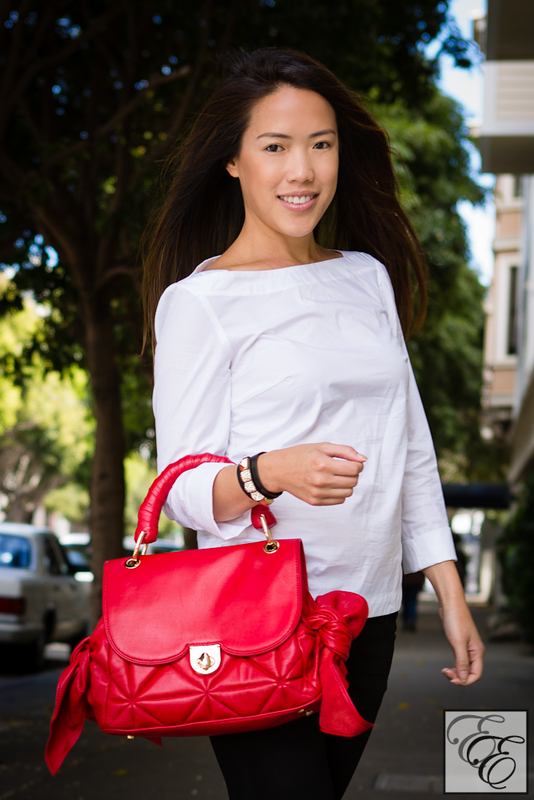 I am enamored with the simple, approachable feel to this bag; it feels like a best friend that will be there with you, through thick and thin. I also appreciate the detail of the two detachable straps, so you can wear it as a purse, or sling it over as a more functional cross-body bag. 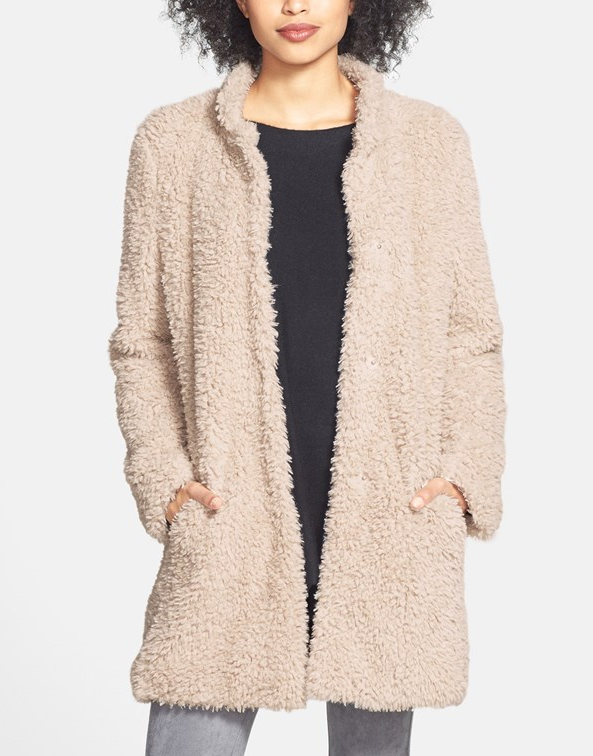 Kenneth Cole faux fur jacket ($99.90): It’s hard for me to resist faux-fur. I love the way it looks, its warmth, how it feels like being enveloped by a stuffed animal… so I had to check this out. The thought was that perhaps it could work as a thick sweater layer, and might look good with pushed-up sleeves and a skinny belt. Well, the mental image I conjured up was nothing like what this looked like in real life. Sure, it felt soft…. but it also made me look more like a well-worn, slightly bedraggled, and shapeless stuffed animal (a.k.a. poor Eeyore with his patched-on tail, or the velveteen rabbit) than a cute and cuddly one. So, take it from me, unless you care more about how it feels than how it looks, or you enjoy being hidden, don’t waste your time with this one. That wraps up my personal recommendations; hope they’re helpful! Does anything look interesting to you? Happy shopping!